The industry has grown at BEC in terms of volume, technological capacity and commitment to innovation during the celebration of Ferroforma, Subcontratación, Addit3D, Fitmaq, Pumps&Valves and Maintenance from 6 to 8 June. A total of 19,200 professionals from 71 different countries have attended this event, which has become the main meeting point for Smart Manufacturing in southern Europe. The amount of professionals who visited the show is especially relevant since this edition has been shortened by one day. However, despite this fact, it has welcomed a higher amount of visitors. The main countries of origin of the visitors was Portugal, France, United States, Italy and Germany. On the domestic front, 70% of the professional visitors came from outside of Bizkaia. This percentage consolidates the inclusion of industry-related events, becoming the benchmark domestic trade show on odd-numbered years. The visitors have come from almost all of the Spanish autonomous communities, but mainly from Catalonia, Madrid and Valencian Community, but also from Castilla-León, Cantabria, Navarre, Asturias, Galicia and Aragón. In terms of their profile, the professional visitors have stood out for their quality, the diversity of work areas and their decision-making capacity. In regards to the activities and conferences in which a total of 121 speakers participated, there were experts in Industry 4.0, automotive, electronic commerce, additive manufacturing, industrial coatings, casting, pumps and valves, and industrial maintenance. The record of visitors throughout the week rose to 706 delegates. One of the busiest spaces of the three days was the one dedicated to the ADDIT3D conferences on additive manufacturing and 3D printing, one of the most dynamic sectors of today’s industry, with a worldwide turnover 5,427 million Euros in 2016, which accounts for a 17% increase. Other poles of attraction those days were the Casting Forum; the Ferroforma e-commerce programme; the Maintenance conferences that focused on “ICT and Predictive Maintenance”, an essential element in smart manufacturing; Pumps&Valves; and the Polveri &ecoCoating conferences, a brand that for the first time ever brought together all the companies dedicated to surface treatments. Furthermore, the B2B Meetings organised at Ferroforma and Subcontratación have been highly-valued spaces by the participants of both events, thanks to the rigorous process to identify strategic purchasers and the management of selective interviews. At Ferroforma, the “hosted buyers programme” has attracted guest purchaser delegations from 32 countries to the Basque venue, who have held a total of 438 meetings with the exhibitors. On the other hand, the European Subcontracting Meeting has managed over 1,500 interviews with contractor companies from the aeronautics, railway, iron and steel, energy, electric-electronic, machinery, general subcontracting, automotive and additive manufacturing industries, mostly from Europe. The Meeting is organised by the Chamber of Commerce of Barcelona with the collaboration of the Spanish Subcontracting Network and the Bilbao Exhibition Centre. 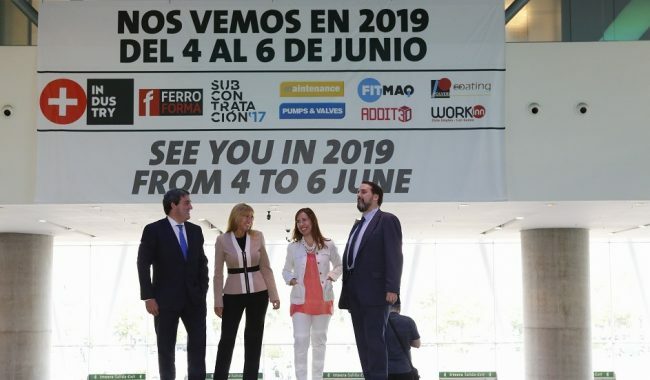 The reactivation of the industry was evident this week in the exhibition halls 1, 2, 3 and 5 of the Bilbao Exhibition Centre. Over 1,200 exhibitors from around the globe have participated in this great platform, offering innovations and ground-breaking solutions for their clients in key areas of industrial manufacturing. The synergies between sectors has been one of its main differentiating elements. The same exhibitors have participated as active clients at the other simultaneous fairs. In terms of innovation, the 3rd edition of the Ferroforma Innovation and Design Contest stood out. Talleres de Escoriaza, who won the first prize, proposed a product called ENTR; the second prize was presented to Ugarte Lantegiak, for their product called BiskaiBolt. For its part, Faraone Sistemas de Elevación, with its innovative Elevah 40 Move Picking lifting platform, was granted the third prize. The importance of SMEs as the driving force of the industry has been another relevant aspect, a company profile that Arantxa Tapia, Minister for Economic Development and Competitiveness of the Basque Country, focused on during her official opening address for Ferroforma, Subcontratación, Addit3D, Fitmaq, Pumps&Valves and Maintenance on the 6th of June. “The true stars of these fairs are small companies, which account for 90% of our entrepreneurial network and deserve more visibility, since they are the heart and the driving force of the Basque industry.” The Minister appreciated the efforts and the results of these companies, which consolidated the recovery of the production in 2016. This trend is remaining steady in 2017, according to the data published by Eustat, which shows an accumulated IPI growth of 2.4%. On the other hand, the official inauguration of WORKinn took place a day later, and was presided over by the Minister for Employment and Social Policies, Beatriz Artolazabal; and the Provincial Councillor for Employment, Social Inclusion and Equality of Bizkaia, Teresa Laespada; who were accompanied by the Minister for Employment and Justice, Mª Jesús San José. The exhibitor and sponsors of the Employment Forum were very pleased with the quality of the visits and the curriculum vitae that they received during the two-day session. It was so successful that it will be held again, coinciding with the International Machine-Tool Biennial Exhibition. Aside from business, training and networking, this week also included other leisure opportunities in which the attendees had the chance to enjoy the local food and music. Two great social acts closed the sessions, which offered other types of experiences to the visitors in the city of Bilbao, while encouraging relationships between the attendees and the general public in a more relaxed environment. Get Together with blues&txakoli and Industry Fest were held on Tuesday and Wednesday, respectively. In general, and due to the volume of participation and the internationalisation of the professional visitors, the impact of the industrial trade shows held at the BEC has been considerable, especially for hotels, retail and restaurants. The hotel occupancy reached nearly 100% during all three days. Last of all, the organising team of EMO Hannover announced the celebration of their new edition, to be held from the 18th to the 23rd of September in Germany under the motto “connecting systems for intelligent production”, at a press conference held on the 8th of June.